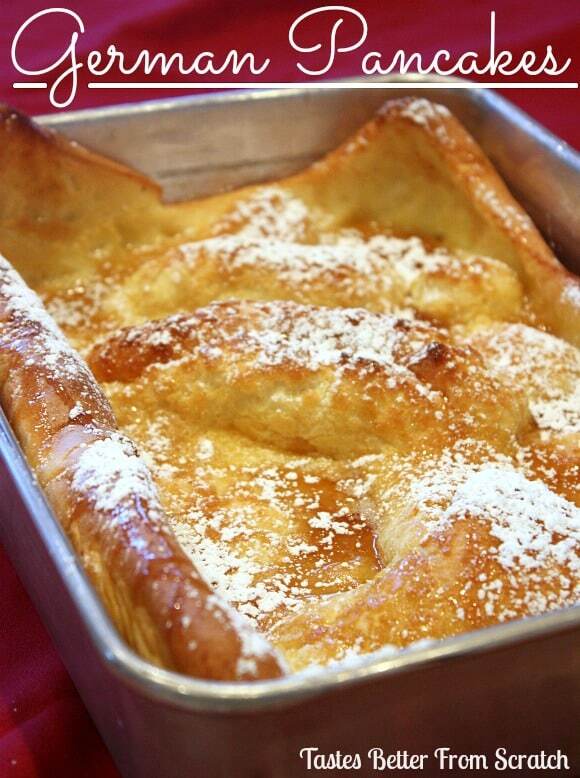 Light and fluffy German Pancakes are a breakfast staple and a family favorite! German pancakes are so easy to make – and you probably have everything on hand. Eggs, milk, flour, salt and butter! Serve with maple syrup and powdered sugar, or top with fruit! Hey guys! 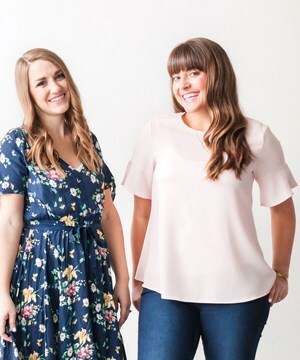 It’s Lauren visiting from Tastes Better From Scratch and I’m really excited to share one of my all time favorite breakfasts with you today. German Pancakes! My mom made these all the time growing up and we all absolutely love them! I love how they puff up in the pan when they bake and I love eating them with powdered sugar and syrup drizzled on top! YUM! The best part about them is they only take about 5 seconds to prepare (you just throw everything in the blender) and the ingredients are items you typically have on hand or are cheap to purchase! Preheat oven to 425 degrees F and add butter to a 9×13 pan, place it in the oven to melt while your oven heats. Add milk, eggs, flour, vanilla and a dash of salt to the blender, and blend until smooth. When the oven is preheated, pour the batter into the pan, and bake until puffy and golden brown. Serve with maple syrup, powdered sugar, and fresh fruit! Want some more fun breakfast ideas? German Pancakes are a classic breakfast your whole family will love. They're so easy too, just throw everything in the blender, then bake! Preheat oven to 425 degrees F. As oven preheats, place the butter in a 9x13 baking dish and put in oven for the butter to melt. Place the eggs, milk, flour, salt and vanilla in a blender; cover and process until smooth. Pour batter into the baking dish with the melted butter. Bake, for 20 minutes or until golden brown and puffy. Can you use a non stick 9×13 or is it better to use glass or metal? You can use any kind. I would still grease the bottom even if it’s non-stick though just to be safe! Made this today and everyone loved it! Yay!!! That is so great to hear! Thanks Toni! These look amazing. Never trued before and now im thinking i meed to asap. We always make german pankcakes at christmas time! We love to eat German Pancakes at our house! They are a fun change from pancakes! I love how fluffy & easy they are to make. Yes! The easiness is the best part! Just made these and they were great!!! Thank you!!!! Yay! I’m so glad you loved them! Thanks Nancy! Just tried this for breakfast. We all loved it! Its super easy anD festive. The kids liked how it grew so big when baked. Thank you! Yay! I am so glad!! These are definitely one of my kids favorites too! Oh my gosh that sounds delicious! Thank you so much! Can one use a glass 9×13 pan? Really yummy thats why this website is called yummly. This seems like such a special treat, but is so easy! one of my all-time favorites! So fast and easy- and clean up is a breeze! could i substitute coconut or soy flour for a gluten free alternative ? I’m not sure I’ve never tried it! I imagine it would work though?! If you try it come back and let us know! i just did 3 eggs and 3/4 cups each, in the cast iron, haven’t tried it in this style pan yet, and I have melted the butter and pour it in the batter and it works that way as well. This looks terrific and I love how easy it is to make! I don’t make breakfast much, but I’ll have to make this! You will love it! We just had them Sunday (a regular in our house) and they were so yummy! I make these but I carmelize some apples with brown sugar and cinnamon and throw those on top of the batter befor baking. I also add a bit more cinnamon on top. Soooo delicious! Mmm! That sounds great! I can’t wait to try it!! We had those “pancakes” this morning but it wasn’t good at all. My 3 year old ate a quarter of the 9×13 pancake (probably because of the sugar on top) but I couldn’t eat it. It just tasted like a weird omelet… maybe the normal 3 eggs, 1 cup flour, 1.5 cup milk would work in the oven as well?! I’ll try that next time or go back to pan frying them. oh that sounds delicious! thank you for sharing! My kids love these. I add a bit of salt and a sprinkle of sugar when preparing. I also don’t use the BLENDER but mix only til mixed well but not overly. Pour into a hot buttered pan and bake 10-12min. Serve the same. This has become a family favorite. It is so easy and I always have the ingredients on hand since they are staples. I’ve made this probably 20 times now and it has turned out perfectly every time. My kids love to watch it come out of the oven. Thank you. I actually serve these with fresh strawberries or raspberries and whipped cream! Made these this morning. They’re soooo good. Thanks for the great recipe. Now I have a new go to holiday breakfast recipe for the family. Hooray!! So glad you love them as much as we do! Whatever country they originated in… YUM! I used to watch our cooks at a breakfast house (Village Inn) i managed and they wouldn’t tell me the recipe! Bad Boys! So now I Know how to do it 40 yrs later! Thanks so much!!! Haha yay!!!! So glad you finally know it! Made my night! Is the batter poured over bread slices? It looks like that in the picture, but I don’t see anything but the batter in the recipe? Nope! It’s just the egg mixture in the pan! How many does this serve?? It makes a 9×13 pan! OMG I just saw u said 9×13. Sorry!! Thanks for recipe!! No problem at all, you are so cute! Haha! Look so great, I can’t wait to try! What size pan should I use? Wow! These look great. And I am sure they taste great, too. But “honor to whom honor is due”: These are rather Dutch pancakes or pannekoeken. In Germany you would use about 2-3 eggs per 1 cup of flour and milk each (roughly) and then fry them in a pan, just like American pancakes. German pancakes are more like thick crepes. No way! That is so crazy my whole life I have thought these were German! Haha. Thanks for sharing! 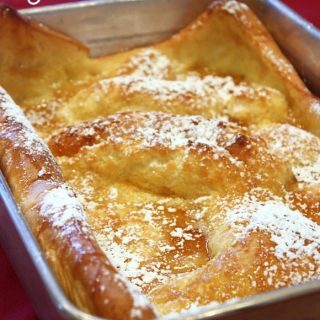 They are actually called Dutch Babies!! Love them! yup ,thats how i make them, born and raised in germany. Really! Aw that’s so awesome! Thanks for sharing! This recipe is really what is referred to as a Dutch Baby. I made these today and I am already texting my friends to rave about it!!!! Thanks for posting!! Yay!!! Oh my gosh you just made our day! Thanks for commenting, were glad you love them! I hope you enjoy them!! Thanks for stopping by! I WANT TO EAT IT ALL!!!! The German pancakes look heavenly! Thank you for sharing this recipe. Can’t wait to give it a try! Thanks so much! I hope you love them as much as I do! Oh yum! My husband makes these but he doesn’t put vanilla in them, and I’ve never put powdered sugar on top, but I am for sure going to add those things next time!